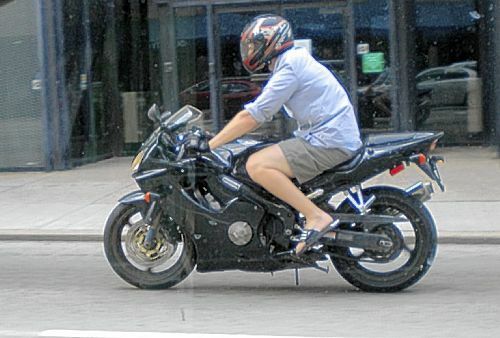 Riding Motorcycles in Flip – Flops! It’s No Day at the Beach! As a veteran motorcycle rider, my pre-ride rituals are pretty well set, so much so that they have become habits. I do four simple steps: a quick check of tire pressure and oil levels, a test that brake and clutch cables are tight and working, a flash of the driving lights and brake lights, and a double check that the key to the gas tank is in my pocket. My pre-ride ritual also includes a check of my riding gear and attire, which is equally well established. Most days, it includes grabbing a helmet, and wearing protective clothing such as long pants and a leather jacket. But it’s also about what not to wear – flip -flops. After years of riding, you learn what works, and what’s safe. Flip-flops don’t make the cut. As the warm weather begins to blanket New England, flip-flops seem to be the footwear of choice for comfort and ease. Only a rare few will be at one of New Hampshire’s beaches and lakes without them. But motorcycle riders should resist the temptation to ride in flip-flops. Over the past twenty years, I have represented many injured motorcyclist for all manner and type of injuries, including broken bones, traumatic brain injuries, and road rash. But of all the injuries I have seen, lower extremity injuries to the feet, ankles, and lower legs seem to be the most prevalent. With such a high percentage of foot and ankle injuries, wearing a good riding boot is a safe bet. They can withstand some abuse and in that way, provide some protection for skin and bone. Flip flops, although comfortable, offer virtually no protection. I will not share with you the gruesome injuries I have seen on clients who crashed while riding in flip-flops. But I will tell you that the images of their heavily damaged feet, ankle and toes (assuming they weren’t scraped off in the collision) are enough to dissuade me from ever riding in flip-flops. I hope it dissuades you too. Thanks for reading this and ride safe this year.